This Lepai Tripath-based mini audio amplifier is ideal for both home and car audio applications. This Lepai Tripath-based mini audio amplifier is ideal for both home and car audio applications. The amplifier's TA2020 amp chip is a 20W/ch continuous average two-channel Class-T Digital Audio Power Amplifier IC that incorporates Tripath's proprietary Digital Power Processing technology. Class-T amplifiers offer the audio fidelity of Class-AB amps combined with the power efficiency of Class-D amplifiers. The Lepai amp's clean, 20 watt output makes it perfect for most any auto or home audio project or DIY application. Google Lepai TA2020 and you'll find this little amp has been discussed and raved about! Each unit has an RCA Left and Right channel input, or you can use the 3.5 mm stereo input jack for plugging in almost any music source, such as iPods, cell phones, or MP3 players. Convenient spring terminals make connections to your speakers quick and easy! 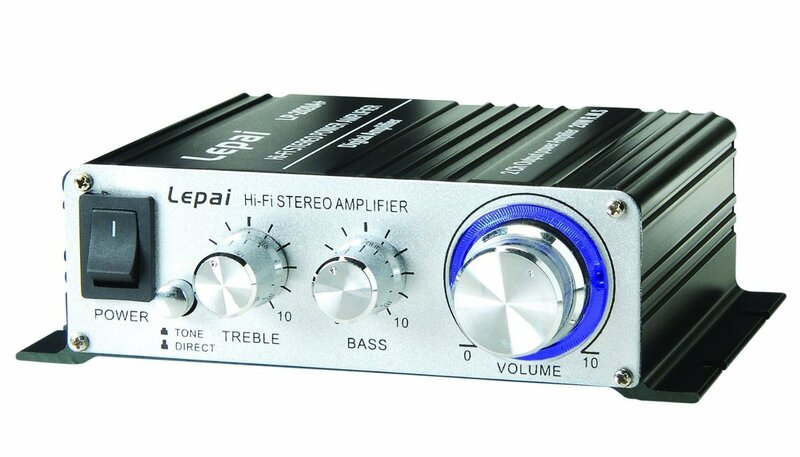 The Lepai mini amplifier has an aluminum enclosure that is lightweight, yet sturdy, and acts as a heat sink to keep the amp running cool. Color may vary.Includes 12V, 2A power supply.Specifications: Power output: 2 x 20 watts RMS ; Input impedance: 47k ohms ; Frequency response: 20 Hz - 20 kHz ; Input sensitivity: 200 mV ; Minimum THD: <0.05% ; Dimensions (D x W x H): 120 x 147 x 42 mm.